Kinsey Auctioneers & Real Estate will develop a marketing program highlighting your property. Your vital plan will involve a concentrated, 45-day campaign that will attract the greatest possible number of buyers within a program that uses your resources wisely, reaching the best buyers possible within the designated budget. We reach targeted buyers not only in the local area, but also throughout the region and even throughout the United States and beyond. We put modern marketing technology to work in creating our advertising materials to market your valuable property. This powerful, graphic detail allows bidders to understand and appreciate the property and bid with confidence. We test our marketing to see what is most effective to maximize your marketing dollars. Our team utilizes state of the art testing which tracks phone calls and website addresses from each of our ads, signage , google analytics and social media sites to see where the bidder activity is most effective. Professional, eye catching, professionally designed brochures and advertisements will be created to market your property. In addition to direct-mailings in your local area, we utilize Kinsey Auctioneers & Real Estate mailing list to get your auction brochure into the hands of interested buyers. We will strategically advertise your property in local, regional, national, and agricultural newspapers and publications. We focus large amounts of attention on this highly advanced method of marketing. We create look alike audiences from proven buyers of our direct mail list and input them into social media platforms to create literally millions of potential buyers for your assets. We also create a page on our website that will focus directly on your assets the create an atmosphere to attract the most amount of buyer potential for your assets. Third-party websites such and landandfarm.com and others will be used to maximize the buyer base. Other online and social media used are youtube, facebook, Twitter. Kinsey Auctioneers & Real Estate also hold the Auction Marketing Management Designation (AMM) given by the National Auctioneers Association. Eye catching large and small signage with pertinent information will be placed at your sale location to attract buyers that drive by your property to increase buyer participation at your auction. For multi-tract real estate auctions,each individual tract will have signs with acreage and contact information. 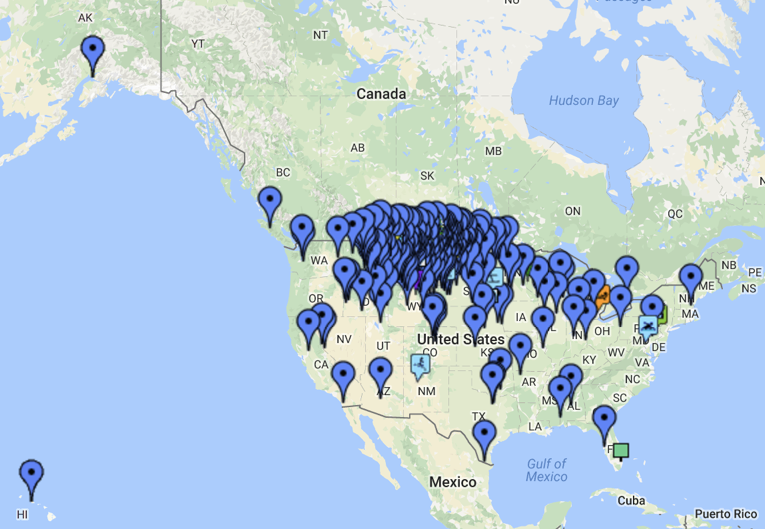 This map illustrates where our past buyers bid from and how our powerful marketing campaigns shows results.